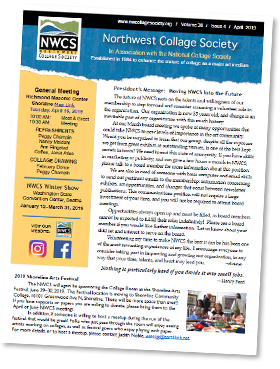 Newsletters are emailed to members preceding each program/meeting. There are five newsletters per year. Click on link below to download a PDF of newsletter. Highlights: April program: Victoria Foster Harrison will present her work and approach to art at the April program. Please note NEW meeting location, Richmond Masonic Center. President's message, member news and calls for art. 2019 Shoreline Arts Festival. Open board position. We need a someone to send out email announcements and notifications to our members. We also need a publicity person to handle listing our shows on different online sources. Can you help? We have many volunteer opportunities within the NWCS, and we urge you to participate. Not only will you be helping the NWCS, but you’ll be meeting fellow members and expanding your artistic knowledge. Contact a board member or come to a meeting to find out more.